I first heard about Girls Lost when a press contact asked me about being interested in a screener of the film, and after reading the description, it certainly caught my eye. A Swedish film about gender and sexual identity with a magical element really sounded different and engaging to me so I took the offer. So without further ado, why don’t I get into the review. 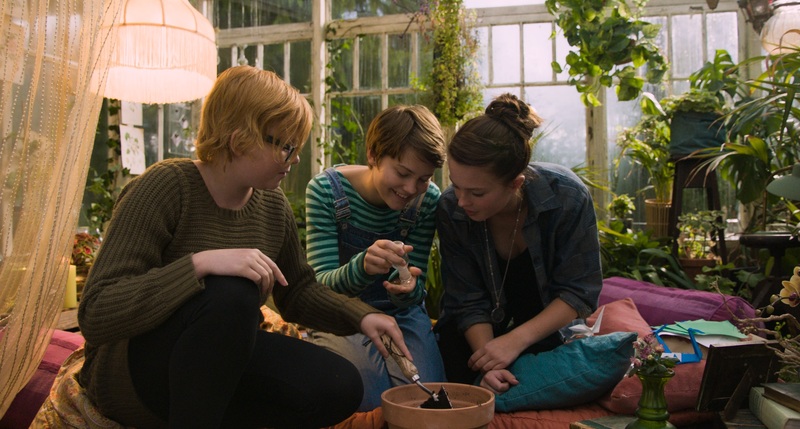 The film is the story of three girls who have been friends since childhood: Kim, Momo and Bella. The girls are far from the popular girls at school, and actually are more ostracized and picked on if anything from their schoolmates. One day, while they are preparing to do some gardening, they realize they’ve received an unusual seed they weren’t expecting, and after planting it it grows at an unnatural rate. Feeling it to potentially be magical they sample some of the juices of the plant and all three turn into male counterparts to themselves. They explore the world as boys for a day or two and it begins to affect how their friendship and self identity plays out. Where the film excels its with its leads together and when it deals with gender identity and it does that well. Especially with Kim explaining fairly early on that she feels different than the girl she appears on the outside and her inclination towards a more masculine look and activity. Where it falters on that for me is just with how hostile the others around them seem to be to them with no allies. Its claimed that they are the weird or ugly girls but besides Kim being a bit of a tomboy and Bella being a little dorky, it really doesn’t fit, especially as Momo is more just a girl next door looking girl. Combine that with no one having a problem with them being bullied and even sexually and physically assaulted, including teachers and other students around them at these times, I find it a little hard to accept the story. I don’t disagree that these things happen, but they make it to be a world where there is no allies or intervention against the very worst of bullying and assault at all, which seems a little forced to just make a point. It also falls apart when the magic takes part and they wonder why they aren’t recognized despite becoming more fit like its a Spider-Man effect and also getting manly voices and different haircuts. It takes away from the analysis of gender identity as it becomes more wondering why our main characters seem to not actually recognize their own transformation, like the writing wasn’t changed when they chose male counterparts that look that different. Overall, the film excels on the use of its cast who, despite the imbalance in the visuals of the magic and the storytelling do bring a lot of heart. The primary lead of the film is Kim and both Tuva Jagell and Emrik Öhlander do a great job of both sides of the character. Tuva showing the tough edge of Kim the girl who can’t be who she wants in this form, and Emrik as Kim the boy who is happy for any inclusion as a boy and doing what she feels it means to be a boy. Louise Nyvall and Alexander Gustavsson play both sides of Momo who is the strong willed heart of the trio who cares unendingly for the other girls (and seemingly one in particular) and really drives the heart and realism to the story for me. Bella is played by Wilma Holmén and Vilgot Ostwald Vesterlund and she feels more like the soul of the group, the one that the other 2 worry about and really sets off the plot. The character has lost her mother and her father has fallen apart and as such she has become quite self sufficient which strikes an interesting balance with how much more displaced she seems in school. Mandus Berg as Tony is a character that was hard for me to understand at first, and that was because I didn’t realize how he fit into the theme of the film at first. He has one of the most dynamic arcs in the film and he plays through that arc very well and really helps with the dynamics of the plot to feel fleshed out. Overall this primary cast really drives the narrative and helps even when the plot and other elements can falter. The film does also benefit from generally good direction from Alexandra-Therese Keining. The film is shot well, with some downright beautiful shots and some scenes with blocking of the actors that tells a lot without any words. The biggest issue is that good directing can’t always fix narrative issues and the last act feels very disjointed from the rest and more rushing to more conflicts, while some previously set up conflicts basically fade away with unsatisfactory conclusions. It doesn’t ruin the movie by any regard, but when a film sets up well for the first 2 acts, it really is sad to see that lack of a strong finish to it all that cashes in on them. Still, Keining does very good with a younger and generally unknown cast to tell the story and highlight the gender issues at the heart of the tale. The subject of gender and sexual identity are more important than ever these days and this film does a good job of looking at the topic and its impact on those that don’t fit the norm. Unfortunately it also struggles with a narrative that is strong all the way through and in making the world feel fully believable as well as to make the magical elements not diminish the characters at times. Its still a solid film and one that those interested in these topics should explore more if they get the chance potentially through an online streaming service.